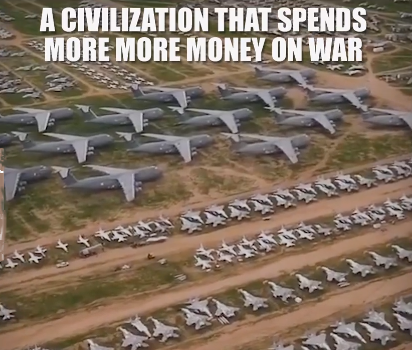 A video appeared in Facebook saying, "A civilization that spends more money on war than on education and peace is anything but civilized." Thinking of the hundreds of billions spent on war I could immediately picture the enormous potential of using these finances for peaceful purposes; education of heart and conscience, global projects for peace, green off-grid water and energy for the suffering regions and so on, and so on. Just imagine if the world leaders grow up to that maturity and realization, how fast the world will be transformed into the desired ideal of God's Kingdom. This means that we have to project goodness if we want to change the environment towards good. But it's so easy to loose faith that that's gonna work. Yet, arming and threatening others with power is not the alternative. Investing in arming ourselves, we create environment for the need of war, the need of enemy. It becomes industry that needs customers. It creates the conditions to invite evil, not unity and peace. "Think of how much money the world is wasting on war. Humanity needs to realize that we are committing fearful sins in the presence of history and our descendants." "In this age, war is the most primitive and destructive means of resolving conflict, and will never lead to lasting peace. Now is the time.. to beat our swords into ploughshares and spears into pruning hooks. Humankind should end the perverse cycle of war, which only sacrifices the lives of our children and squanders enormous sums of money. The time has come for the countries of the world to pool their resources and advance toward the kingdom of the peaceful, ideal world desired by God, the Master of this great universe." Giving love and living for the sake of others is the best defense. Once you are in God's love you don't need to worry, Bible says. Those who are afraid and self protecting are those whose conscience tells them that they still have walls in their hearts. True society and nations cannot appear without true families. Family is the 'School of Love' and the 'cornerstone' of the ideal society. The only way to end crime, corruption and immorality is not through external force, but through expanding the culture of true families. The divisions of our world were wrought by Satan. God is warning us that He will no longer tolerate separation and division. "This project is for the sake of the establishment of the kingdom of peace.. God’s homeland and original hometown. From the historical point of view, the divisions of our world into East and West, North and South were wrought by Satan. I am proposing that we build a passage for transit across the Bering Strait that separates the North American and Russian land-masses. This passage, which I call the “World Peace King Bridge-Tunnel,” will link an international highway system that will allow people to travel on land from Africa’s Cape of Good Hope to Santiago, Chile, and from London to New York, across the Bering Strait, connecting the world as a single community. God is warning us that He will no longer tolerate separation and division. Carrying out this project will bind the world together as one village. It will tear down the man-made walls of race, culture, religion and country, and establish the kingdom of the peaceful, ideal world that has been God’s cherished desire. The United States and Russia can become as one. The European Union, China, India, Japan, Brazil and all nations, and also the world’s religions, can combine their energies to make this project succeed. The success of this project will be decisive in establishing the kingdom of the peaceful, ideal world, where people will no longer make war on each other.